“Try to remember the kind of September….” who doesn’t remember this lovely melody? But did you know it was from “The Fantasticks”? 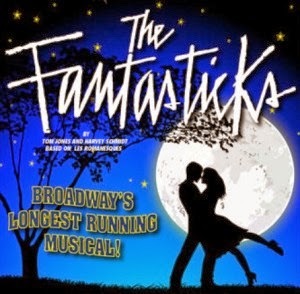 Broadway’s longest running musical is playing at The Five Star Dinner Theatre in Hot Springs through October 26, 2013. The Fantasticks tells the story of two young neighbors who fall in love in a plan cooked up by their fathers who are pretending to feud. When the children discover their fathers’ deception, they break up and go off to experience the “real world”. Disillusioned by what they find, they return to each other and their joyful fathers. Tickets for dinner and show are $39.95 and show only is $24.95. Shows are every Friday and Saturday night, with dinner starting at 6:00pm and the show beginning at 7:00pm. If you’re planning an October trip to our Hot Springs bed and breakfast, you should include The Five Star Dinner Theatre in your evening plans!